The world is mourning the death of another larger-than-life pop culture icon, hero, and force of sheer nature: Muhammad Ali. Ali became the heavyweight champion in 1964 by beating Philly boxer Sonny Liston. In the early 1970's, he trained in the small town of Deer Lake, PA, about an hour and a half northwest of Philadelphia. Perhaps Ali's biggest Philly connection were the three infamous boxing bouts ("The Fight of the Century" in 1971, "Super Fight II" in 1974, and "The Thrilla In Manilla" in 1975) with Philadelphia's real champ (sorry, Rocky! ), Joe Frazier. There was no love lost between these two titans, as can be seen in the below video clip from the Philadelphia filmed and produced The Mike Douglas Show. Lastly, in September 2013, Ali received the highly prestigious Liberty Medal during a ceremony at the National Constitution Center in Philadelphia. You can read and watch more about Muhammad Ali's life from our catalog list, The Greatest of All Time, as well as view a selection of correspondence letters between Ali and poet Marianne Moore, temporarily on display in the library partner desk of the Rosenbach. 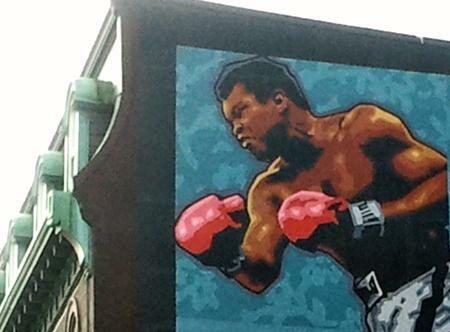 Muhammad Ali portion of the boxing mural at the once Legendary Blue Horizon boxing arena, 1314 North Broad Street. Loved the Mike Douglas Show clip. Classic!